Though mid-week numbers were somewhat lower than expected, Warner Bros./New Line’s “Shazam!” easily stayed at the top of the box office charts with a $25 million second weekend, dropping a decent 53% from its $53.5 million opening. That gives the DC blockbuster a domestic total through two weekends of just under $95 million. 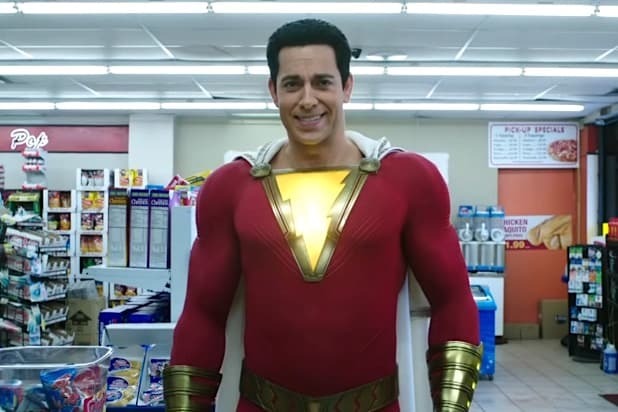 Depending on the performance of the horror film “The Curse of La Llorona” next weekend, “Shazam!” has a chance to stay No. 1 for one more frame before “Avengers: Endgame” takes over the box office. As for this weekend’s new releases, two of them are on their way to become big flops. One is Lionsgate/Millennium’s “Hellboy,” which has been panned with a 15% critic score on Rotten Tomatoes and a C on CinemaScore. With such poor word of mouth, the R-rated reboot of the Dark Horse Comics hero sits third on the charts with a $12 million opening from 3,303 screens, below projections for a $17-20 million opening and against a reported $50 million budget. Also struggling is Laika’s latest stop-motion animated film, “Missing Link,” which was distributed by United Artists on 3,413 screens. Unlike “Hellboy,” this film had characteristically strong reception for a Laika film with an 88% Rotten Tomatoes score and a B+ on CinemaScore. The decline of stop-motion films at the box office continues, with “Missing Link” coming in as Laika’s worst opening weekend yet at $5.8 million. That is less than half of the $12.6 million opening earned by 2016’s “Kubo and the Two Strings,” which was Laika’s previous low opening. Despite an Oscar nomination, “Kubo” barely made back its $60 million budget with $69 million grossed worldwide. One new release that did do well was Universal’s “Little,” which hit tracker expectations with a $15.5 million opening from 2,667 screens. Produced by Will Packer Productions on a $20 million budget, the film received mixed review with a 50% Rotten Tomatoes score. But the film was a hit with its primarily female, African American audience, who gave it a B+ on CinemaScore. Even after the release of “Avengers,” “Little” may have a chance to leg out well as counterprogramming to the superhero blockbuster. The fourth new release was Aviron’s romance film “After,” an adaptation of the Anna Todd romance novel of the same name. While critics panned it with a 13% Rotten Tomatoes score, it performed slightly above tracker expectations with a $6.2 million opening against a $14 million budget, sitting at No. 8 on this weekend’s charts. The film earned a B on CinemaScore. Among holdovers, Paramount’s “Pet Sematary” and Disney’s “Dumbo” each earned $9-10 million this weekend to complete the top five, with “Pet Sematary” now holding a 10-day total of just under $41 million. “Dumbo” has now grossed $267 million worldwide with a $90 million domestic total.